Sift dry ingredients onto wax paper or into a bowl. Set aside. In a small bowl combine buttermilk, vanilla, & sweet potato. With an electric mixer on medium-high, beat the oil, sugar & eggs for 5 minutes until thickened. On lowest speed add buttermilk mixture followed by flour mixture. Spread into pan and bake for 25 minutes or until toothpick inserted in center comes out clean. Cool completely in pan on wire rack. In a bowl with an electric hand mixer beat butter & sour cream. Add powdered sugar, cocoa and vanilla. Adjust consistency with sour cream or milk, beating well. No buttermilk? See Substitutions in my blog. 48 Comments on "Sweet Potato Chocolate Cake"
Made this cake with a leftover baked sweet potato I had in the fridge. I used Truvia baking blend in place of the white sugar. Truvia blend is 1/3 sugar, 1/3 erythritol and 1/3 stevia. I also used the white whole wheat flour option in the recipe. The cake isn’t as sweet as most but it’s perfect with the chocolate frosting! Thank you Jenny! I am enjoying so many of your recipes. Wish I had found you sooner! Baked 3 times in 3 weeks. Kids love how tasty the moist cake turns out. Baked for sons bday dinner with ribs. Use the sweet potato water for baking 3 loaves of bread next day!! Thanks for recipe, it’s a keeper. Delicious! Moist and beautiful texture. I made less icing and added orange extract to it which really complimented the cake and still plenty sweet. This is definitely going in my recipes. One little thing…when you click on print it is the same recipe but labeled as Zucchini chocolate cake? Thanks for an outstanding recipe! Thanks for letting me know. We fixed it. I finally made this cake yesterday for Valentine’s Day! It’s the perfect recipe for my Heart shaped pan. It takes a 9″ cake recipe. The cake was nice and high and rose to fill the pan perfectly for a 2″ high cake. It was very moist, and not overly sweet, which is exactly what I was hoping for. Instead of the butter cream frosting, I chose to make a dark chocolate ganache frosting instead and that was a big hit with my hubby and son! You can not taste or detect the sweet potato at all in the cake. This recipe is a keeper, and it will forever be my go-to for my heart cake! We loved it! Thank you for sharing this perfect recipe. Excellent, moist chocolately cake and a great way to use up a leftover sweet potato! I baked it in a 9×9 square pan lined with parchment paper and it rose right to the top edge. 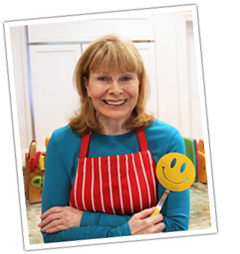 Thank you for your healthful recipes! Does it matter what color the sweet potatoes are? The only sweet potatoes I know are orange inside. Just made this because my parents dug up more sweet potato from their yard. Jenny, I usually follow the recipes as published, but for your frosting, I don’t usually have sour cream on hand. can I substitute Fage Greek Yogurt for the sour cream? I’m not sure since I only use reduced fat sour cream. If you try yogurt, I would stay away from fat-free and stick with full fat or 2%. Let us know how it turns out. Can I use dutch process cocoa? Yes, in fact it’s the only kind I use and I am adding that note to the recipe so thanks for asking. Hi Jenny, Can I use medium eggs? Not sure if it will make a difference. It’s hard to say. Sometimes even the smallest change can cause problems with baking – in this case the batter could be a little dry with medium eggs. To guarantee a perfect cake, I suggest waiting until you have large eggs, which are the standard in most recipes. I want my recipes to be great for everyone and I know they will be, but only if no changes are made. Made this and it was a success! Was wondering if the cocoa can be omitted to make a white cake? The color would not be a white cake with sweet potato and also, it would not taste like a white cake (flavored with vanilla) because the sweet potato would over power the cake. I would not try it. If you can wait, I will be posting a healthier white cake recipe soon. Hello I am in the process of trying to reduce the sugar in my families diet so this looks like a good one. Could I use an egg replacer in this recipe? one of my children is allergic to egg. I’m sorry I have no experience with egg replacers. If you bake other cakes with an egg replacer and it works I guess you could try it with this recipe – I have only baked with real eggs so I’m sorry I’m not able to help here. Hi Jenny, just wondering how you cook the potato for this recipe, boiled or baked? I like to peel, cut into chunks, and boil the sweet potato so it has more moisture. Thank you…am trying this on the weekend. I just made this cake this evening as written, and it’s beyond delicious! 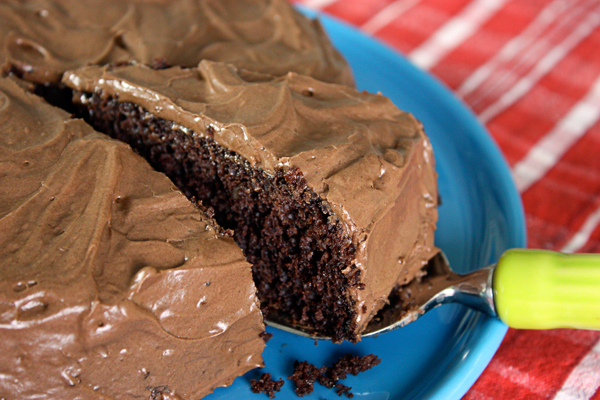 Moist and chocolatey. Thank you for the recipe!!! I made the cake today and it was absolutely amazing! Very moist and rich! I’d like to make this today all I’m missing is the buttermilk for the bread part. Can I use milk, sour cream or Kefir? I’ve never found a good substitute for buttermilk, which provides the acid needed to make this cake light. Sometimes just one change in baking can cause a recipe to fail and this cake is worth waiting until you have the right ingredients. It’s an amazing chocolate cake. I actually made it without the buttermilk. I read that I could make my own buttermilk by mixing milk and lemon juice, so I did. I also substituted 1/2 of the white sugar with coconut sugar and half of the olive oil with coconut oil. I doubled the recipe and made muffins instead. Baked them at the same temp for only 20min. I must say; next time I will add a bit more coconut sugar to make them a bit sweeter since coconut sugar is not as sweet as white sugar. Didn’t have time to make the frosting so I used organic chocolate hazelnut spread. My kids loved them!! (ages 4,7,8). They are great at eating veggies, there are only a few that they will not eat and sweet potatoes is one of them. Thanks for the recipe! I’m so glad it worked out and thanks for sharing the details. used it as a guide to try using glutein free flour and coconut flour. I added 4 eggs,used cocnut oil, and yakon,stevia, and coconut sugar.I added 2 extra eggs but should have added 5 I think and some water and cocnut milk. I know it will be heavy. Maybe it can appear as a bundt cake. and what about using coconut sugar,stevia, and yakon. I am trying it now and it see,s great but I think it will be a heavy cake like a bundt cake. Can I use this recipe to make cupcakes? I never have but I believe you can. I see other recipes that say they do both. I can’t wait to try this recipe. I have a question, if I choose to use 1/2 cup all purpose flour and 1/2 cup whole wheat pastry flour, do I still need to add the remaining 1/4 cup that makes 1 1/4 cups as stated in the recipe? If so, which flour you recommend I use for the 1/4 cup? Thank you. You will still need 1 1/4 cups of flour and if it were cookies, I would make the extra flour whole wheat pastry flour, but since it’s a cake and you want it soft, I would use all purpose flour for the extra 1/4 cup. Thank you. Would that be Arrowhead Mills Organic Pastry Flour that you use or King Arthur Whole Wheat Flour? I think Publix carries it. Thanks again. I use any brand I find. My grocery store carries Arrowhead Mills so it’s usually the one I buy but King Arthur makes good products too. I thought the total flour was to be reduced if subbing white whole wheat pastry per the note in the recipe! So, my cake was made with only one cup total flour (half cup of each type). It turned out great! I would like to thank you for your delicious,simple and the most important thing which is healthiest recips . I’ve baked this sweet potato chocolate cake, the macaroons, cinnamon rolls, doughnuts, flat bread and they all turned out so good and yummy . That cake looks awesome. Can I double the recipe and make it in a 9 by 13 inch pan? I have a big family. It’s not as simple as it seems to double a recipe when baking and just use a larger pan. It may require some minor ingredient changes as well as a different baking time. I can’t advise further since I don’t usually take that chance so I can only suggest that if you want guaranteed results, make two separate cakes. Thank you so much for the beautiful recipes and posts! Can your cakes/muffins be made with whole wheat pastry flour instead of AP flour? I’m trying to convert us completely away from AP flour and your recipes sound wonderful. The only one I’ve noticed so far is the brownies recipe. Yes, you can use whole wheat pastry flour. It won’t be quite as light but healthier, yes. I have done it with half and half (white + whole wheat). I made the sweet potato chocolate cake and I promise it will be the only chocolate cake I make from now on! Loved the icing too! !